I have some kinds of Begonia in our garden. The one that I have in the photo here is one kind of it. These are very lovely flowers for me and I love them. The disadvantage is that they don't come back every year. They are gone in the winter time and I have to buy it every year...not so good fore the pocket! hehehe. Unlike the different roses which I planted in our garden, they always come back every year. here are my lovely begonias and also a little info about it. Happy TF day to all! take care everyone and have a great week ahead! Begonia is a genus in the flowering plant family Begoniaceae. The only other member of the family Begoniaceae is Hillebrandia, a genus with a single species in the Hawaiian Islands. The genus Symbegonia is now included in Begonia. "Begonia" is the common name as well as the generic name for all members of the genus. The genus name coined by Charles Plumier French patron of botany honours Michel Bégon, a former governor of the French colony of Haiti. 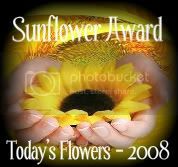 Click the logo and feel free to join and see the beauty of flowers from all over the world. Special appreciation to Luiz and company for this very wonderful meme. Oh wow those are very pretty. Love that soft color. They kinda remind me of roses. Hope you have a wonderful Sunday. This color is great, and a wonderful photo. yes they are lovely and your photo of them is as well. vrey lovely begonias...they are nice to grow and bloom wonderfully...cheers. I think your pink begonia is more lovely than the red! what a lovely color, very pretty and attractive. I put mine at My Little Angels. Hi this is a lovely Begonias. I love this kind of Begoinia; the shape of its lovely flowers, its color! Great photo! Very beautiful photograph of the Begonias! Your Begonias are lovely the color is amazing!..